Explore the bayous and byways of southern Louisiana, just outside of New Orleans! If you are searching for a gorgeous, natural and picturesque Kayak Swamp Tour – This Tour is For You! 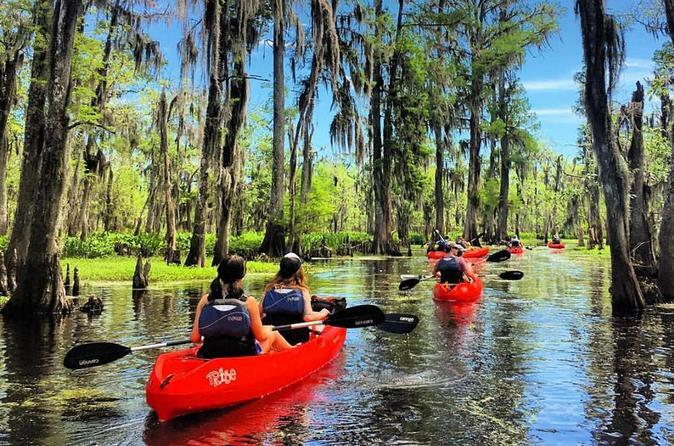 Paddle through dense cypress forest, expansive wetlands, and an array of wildlife on a tour that is ideal for beginners and adventure seekers alike! Kayak tours are fully guided and last between 2 to 2.5 hours. The duration of the full tour will be up to 3 hours, with a 45 min drive from New Orleans. See dense cypress forest, expansive wetlands, and an array of wildlife surrounding you as you paddle on waters that are ideal for beginners and adventure seekers alike. Tour takes place at the Manchac/Maurepas Swamp, 45 min drive from New Orleans. See confirmation email for details if you plan on meeting us out there. Kayak Tours can be arranged for a minimum of 2 people, with a maximum of 8 people. For single paddlers, you can be added to a trip already organized unless a private tour is preferred. You will be using tandem kayaks only on the swamp tour. (Single kayaks available for odd number groups). Please note: gratuity is not included in kayak tour price. Your guide works hard to ensure your safety and well being, please let them know if you had a good time.